Introductions to Glasgow Architecture invariably unfold in a fairly standard type of Marxist farce. History may repeat itself, the great bearded prophet said, but where the first time round it is tragedy, the repetitions are merely farcical. There is a tradition of fine published architectural guides to Glasgow – one thinks here of course, of Gomme and Walker’s ‘Architecture of Glasgow’ and Doak’s ‘Glasgow at a Glance’, both from the 1960s; McKean’s ‘Glasgow’, and the Glasgow volume of Penguin’s ‘Buildings of Scotland’ series, both from the late 80s – but in some way most of these publications follow the same format. And yet all these publications are well worth reading, and in fact invaluable for a sympathetic and complex understanding of the history of Glasgow’s architecture. Neither are their perennial bouts of depression and renewed optimism entirely to be scorned. But could it not simply be the case that the institutionally sclerotic form – printed and published matter – is not adaptable to an accurate and realistic account of this dynamic phenomenon: Glasgow Architecture. For Glasgow is the great capitalist city. (If it was a great Victorian city is that not because that period represents its era of most confident and expansionist capitalism?) As such the architecture of contemporary Glasgow, as a physical manifestation of the flows of capital in advanced multi-national markets is bound to be in continual flux; always involved in a little disaster or regeneration or two, reflecting the boom tom bust and incessant doing, undoing, and redoings of those markets. It is precisely for that reason that the singularly most appropriate tool for analysis of this phenomenon must now be the vehicle developed for information and communication by advanced capitalism itself: namely the internet. Only here, on the web can the truly minute-by-minute nature of mutations be recorded in a way which avoids descent into time-bound judgements of an ultimately and unavoidably farcical character. But let’s not throw the architectural baby out with the publisher’s bathwater. Through that tradition of published studies and guides to Glasgow Architecture a great body of knowledge about the historical urban development of Glasgow has been accumulated: for reasons outlined above these should not be forgotten or ignored, but adapted to the new format. Forms like the Glasgow Square with a building in the middle (see for example Nelson Mandela & St Andrew’s Squares) have been identified. How has this form been adapted by contemporary architecture, and why? From this point of view the recent ‘Homes for the Future’ development has been criticised for being neither futuristic, nor having learned anything from the past. It is furthermore, with these criticisms in mind that on this website we should be able to follow the development of RMJM’s second stage of the ‘Homes for the Future’ project. One other principal architectural feature that has been much analysed is the gird plan of Glasgow’s city centre. While on the map this grid may resemble that of countless North American cities, it is in the imposition across the steep slopes of Blythswood Hill, and the development of urban design to take advantage of this topography that has given the Glasgow grid its special character. Yet over the past few years, this special character seems eroded somewhat by a laxity on the part of Glasgow planners. Buildings of abnormal height, such as the UGC Cinema GlasgowRenfield/Renfrew Street have been given the go-ahead, and there has been much criticism of Gordon Murray + Alan Dunlop Architects’ buildings ‘Spectrum Building’ and ‘Bewleys Hotel’, both of which can be said to ‘rupture’ the grid. I have said elsewhere that these architects are certainly engaging with the metropolitan spirit of the city, and there is already much discussion here on the site. 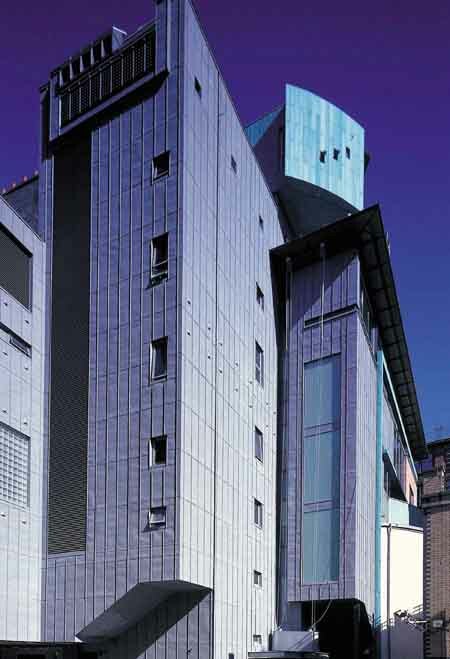 Their new Radisson Hotel Glasgow for example, has a massive curved pre-patinated copper wall exploiting and emphasising the breakdown in the grid where it meets the ancient Westergate (now Argyle Street). There has already been a predictable, if contemptibly inaccurate attempt at journalistic nicknaming of this building (see Glasgow News), but the important thing is that the serious debate on the grid can take place here and now. In his book Gomme remarks upon the incestuously local nature of architects involved in Glasgow. That is still the case now, but it is surely no bad thing for designers to have intimate knowledge of their material. Both Dunlop & Murray above, and Paul Stallon, who is driving much of the urban agenda of RMJM Glasgow, are typical examples of home-bred professionals. There have however, also been some high profile outsiders involved recently in the city, and noticeable in particular here is Foster & Partners’ Conference Centre – SECC Glasgow, and David Chipperfield’s winning design for the BBC Headquarters. Both these buildings are, or will be, at the centre of the focus for new development in Glasgow over the coming years: the River Clyde. While Chipperfield’s BBC HQ will have the job of tying the riverside object buildings like the Science and Conference Centres into a coherent cityscaping of the former Garden Festival site such that it integrates wit the rest of the city, on the north bank of the river the Meadowside Quay is to be transformed into a mixed commercial and residential scheme. This latter scheme and many others are already being mentioned with some up-to-date analysis and criticism on glasgowarchitecture.co.uk, and that is entirely as it should be. If you hope to understand something about the day-to-day momentous changes that occur with nonchalant regularity in this city, but you seek an understanding that goes beyond the twisted, cynical and hackneyed demagoguery of the newspapers, then don’t wait years for the next retro-analytical publication, log on and participate – on a daily basis! Interested in a Tour of Glasgow’s best buildings?